Are you looking for a new mobile phone? 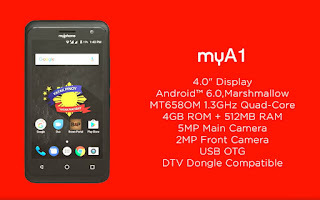 Why not try the MyPhone myA1. It is very affordable and powered by Android 6.0 Marshmallow operating system. For only 1,799 pesos, you can have a phone that you can use for calling, texting and surfing the net. You call install your favorite social media apps like Facebook, Instagram, Twitter and others application you like. It runs on a Mediatek MT6580M quad core processor with 4GB of internal storage where you can save your files and installed apps. For the RAM, it has 512MB that is enough to handle the basic task. For the camera, it has 5 megapixels on the rear side and 2MP on the front that you can use to take pictures. It also supports 3G connectivity if you prefer mobile data browsing or use the Wi-Fi feature, if want to connect open hotspot. This device is the USB OTG support where you can easily add up storage space and move files from your phone. You can also watch your favorite TV shows using this phone with the help of DTV dongle compatibility. 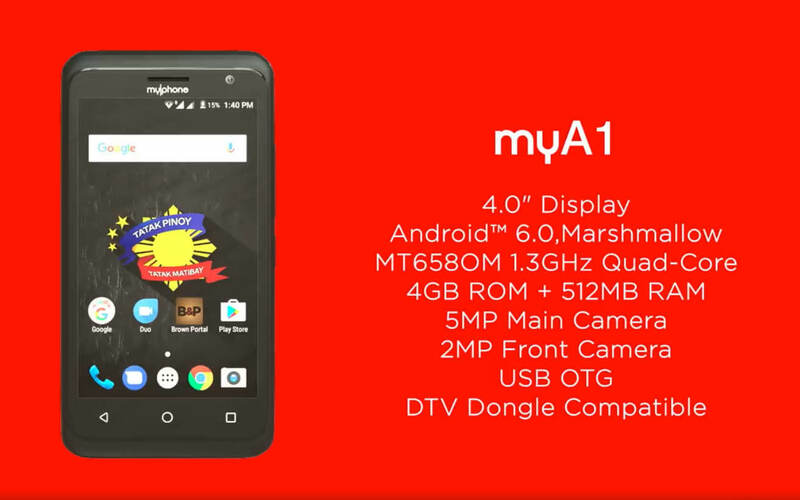 For the price of MyA1, you cannot ask for more as it already features all your basic needs of a smartphone under 2000 pesos budget.